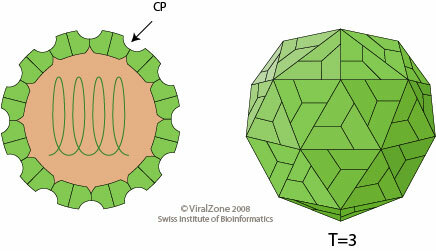 Non-enveloped, spherical, icosahedral, about 30 nm in diameter, capsid with a T=3 icosahedral symmetry. 30 hexameric capsomers per nucleocapsid (virion composed of 180 protein subunits). Linear, ssRNA(+) genome of 4.4 kb, which lacks a cap structure and a poly(A)tail. The virion RNA is infectious and serves as both the genome and viral messenger RNA. Two 5'-proximal ORFs are directly translated to produce the viral constituents of the replicase complex. RdRp is translated through suppression of termination at the end of ORF1. The downstream genes encoding the movement protein and capsid proteins are translated from two subgenomic RNAs. The viral suppressor of RNA silencing (VSRs) protein is expressed by leaky scanning from the MVP mRNA. Aureusviruses encode P14 which acts as a suppressor of RNA silencing .